Slick Productions - So much fun, there's no way it could be legal! Configurable Samplerate (8000 - 96000 Hz playback). Mono or Stereo playback (with configurable panning and optional pseudo-surround sound effects for each channel). Individual channel volume control and mute option. Support for NSFEs which allow for individual track time specifications. Silence detection, so that ends of songs/sound effects are detected and skipped. Various methods to reduce ugly popping sounds. Several sound filters, and the option to adjust the strength of the filter, and even the option to disable them completely. 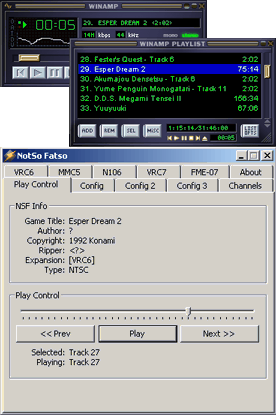 NSF "Shadow" feature, which allows you to have a single track represented by a single entry in Winamp's playlist. Speed Throttling to allow you to speed up / slow down the playback of a song. Options to be less strict with NSFs (so that NotSo will work with NSFs which are not quite ripped properly). Also useful to nsf rippers for debugging their rips.